Henry Kendall was born at Ulladulla on the 18th of April, 1839. His childhood was spent on the NSW mid-north coast, in the Illawarra region and Clarence River. When he was 15 he joined the crew of a whaling vessel with one of his uncles. After two years at sea he moved to Sydney where he began working as a clerk. It was here he began to share his writing with others, including fellow poet Charles Harpur and editor Henry Parkes. They encouraged him to foster his talent and his work was published in several local Sydney publications, as well as a London-based magazine, the Athenaeum. His first book, entitled Poems and Songs was published in 1862. Kendall married Charlotte Rutter in 1868. Full of optimism from his early success, he moved to Melbourne in 1869 hoping to make a living solely off his writing, but it was not to be. Struggling financially, fighting an alcohol addiction, poor health and mental illness, his life was not always a happy one. One of his most poignant poems is about his daughter Araluen who died at a young age, and we know that he lost his father when he was only 10. Despite these hardships, his poems remain as a testament to his talent and his love of the bush. They are beautifully lyrical and descriptive of the Australian mountains and landscapes where he grew up. Kendall was one of Australia’s colonial poets and his book Leaves from Australian Forests [published 1869] “is regarded by many as the first really Australian book of poetry” (Hamilton, 1983). Themes of droving, living on the land, indigenous experiences and bush ballads are featured in his writing, which predate the famous verses of Henry Lawson and Banjo Paterson. His third and final volume Songs from the Mountains was published in 1880. Kendall’s last few years were spent working for Australian Forestry at Camden Haven, where he was taken in by the brothers William and Joseph Fagan. The town has since been renamed in his honour. 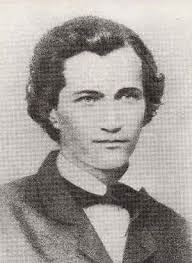 Kendall died of consumption in 1882 at the age of 43. Present day memorials to the poet can be found in the town of Kendall, at the Botanic Gardens in Sydney and in Gosford, where his old residence has been preserved and converted into a museum. Down the ridges and gullies we go! Start the echoes away from their caves! Like a tempest, are tearing the ground! Will die with the echoes away! With the nullah, the sling, and the spear. At the sounds of a wonderful song. Kendall, H 1970, Leaves from Australian Forests, Lloyd O’Neil, Hawthorn VIC.